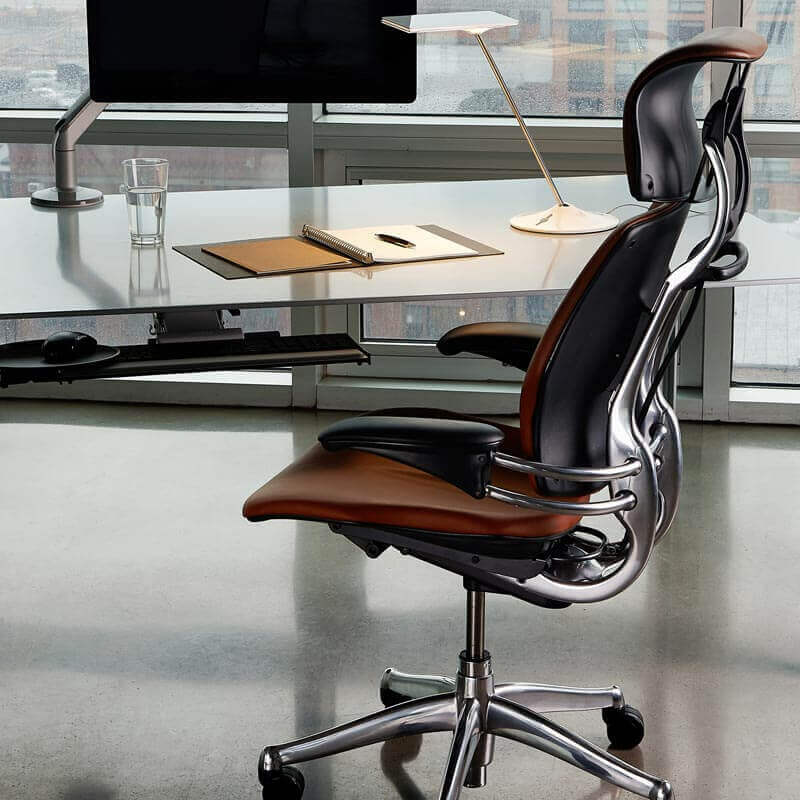 What features make the Humanscale Freedom Chair Great? Humanscale Freedom Chair Review is the best simple office chair, thanks to minimal manual adjustments. It is also simple to assemble, fully ergonomic and is very stylish in design. This chair offers you freedom from having to do so many manual adjustments. In fact, when you use it, you will see why the name Freedom befits it so much. 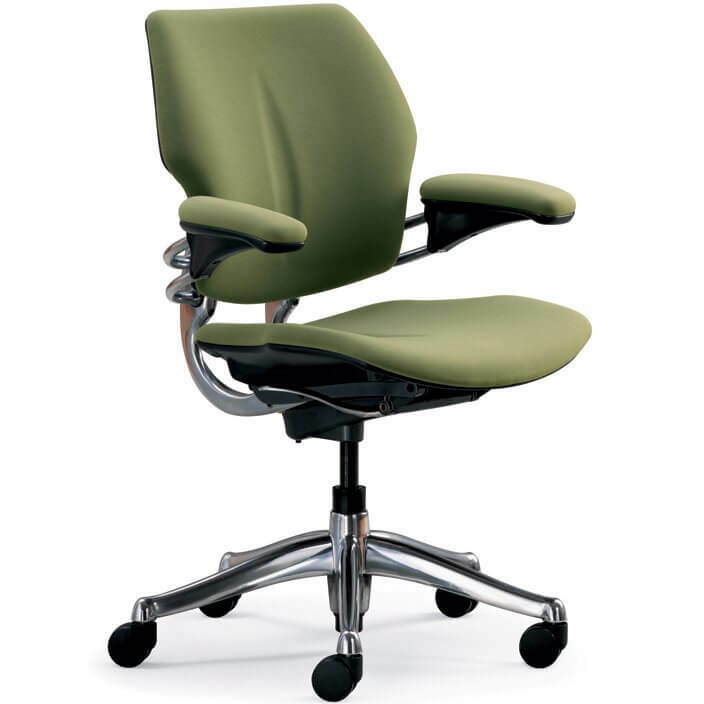 When you read any Humanscale freedom chair review, you will see it is a kind of plug-and-play chair. Just put it together and you can sit down, letting the chair find the right posture for you. This is also the best chair for sharing. Just imagine a chair where all the functions, including the backrest are set manually. It would mean too much tinkering with the chair every time a different user has to sit down on it. When you need a chair to accommodate all users at home or in the office, you will find the Humanscale Freedom chair the best. It can offer the best sitting posture to anyone. The only things that people have to adjust manually are the armrests and the height of the chair. Limited manual adjustability means that you do not have to tinker with levers and knobs. Just sit and start working straight away. Who wouldn’t like that? Self-adjusting backrest will increase or decrease the tension depending on the weight of the user. Heavier users get more give/tension than slimmer users. When you lean back, the backrest pushes against your lower back, something that leaves you well supported throughout the sitting experience. The seat pad is very comfortable. It has beautiful and well curved edges that do not press against your thighs or the back of your knees. The pad is made of gel that does wear out easily. It also does not lose shape with time and usage. When you do not need to use the arms of this chair, you can just lower them low to the seat level and raise them again when you need to use them. This chair does not come with a headrest. Such an addition is optional though, for a small extra fee. It can make all the difference to some people while others just don’t need it. You can adjust the height of the chair from 16 inches to 21 inches. That should accommodate more than 90 percent of the global population. The first and most important feature in this Humanscale Freedom Chair review is the automated lumbar support. When you sit down and lean back, the chair “decides” what tension to deploy in the backrest that is equal to your weight. The armrests of this chair are indeed intriguing. They are attached to the backrest by steel tubes. This means that when you lean back, the armrests lean with you. They make it even easier to relax. When you do not need the armrests, just lower them down to the level of the seat. There are those times when you definitely need more space and the armrests just get in the way. The seat is adjustable. In fact, you can move it forward or backward by touching a small lever that is located behind the seat. With about 2.25 inches of playing room, you will find the perfect sitting position for your work. The edge of the seat is also so well curved so that there is no chance of affecting the blood circulation to the legs. This chair is also available in different colors. Maroon, blue, gray and black seem to be the favorites. If you like, perhaps you can even order one with different colors. The brighter colors would be good for your home while neutral and duller colors are good for office settings. Even with minimal adjustments, the comfort that you enjoy from this chair is worth a mention. It also lets your spine stay in the most natural shape. The breathability and general comfort of this chair are irreplaceable. Save time, as there are fewer knobs and levers to tinker with. The adjustability is almost automated. You will only need to adjust the armrests and the height, and the seat. To have this beauty gracing your office space, you will have to pay anything from $800, probably more depending on the features that you choose. For example, the one with metal base plus headrest costs more than the one with plastic base. 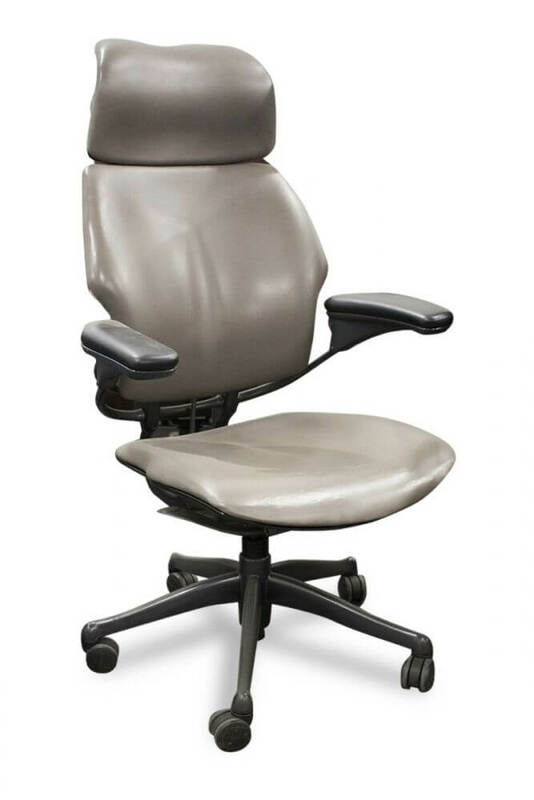 After reading this Humanscale Freedom Chair review, you can see that office ergonomic needs have been met almost perfectly. Stylish, superbly constructed and many beautiful adjectives can be heaped on this chair. Does it give value for your money? It definitely does. This is one of the “costly” investments that you make with some regret, only for the regrets to be washed away when you start using it. It is simply … the best simple chair.